Swami says ‘Awareness is life’. The entire purpose of education is to generate this awareness in the pupils. Without it men and women become centred in themselves, and live only for themselves. 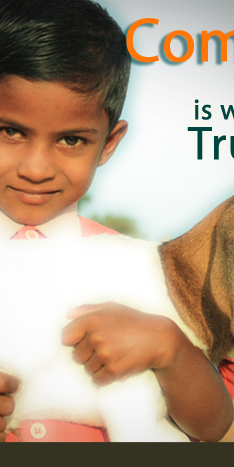 Bhagawan teaches us that true realization is ‘the seeing of all in all you see’. ‘If you cannot see God in your fellowman, how can you see Him in a stone idol?’ He asks. 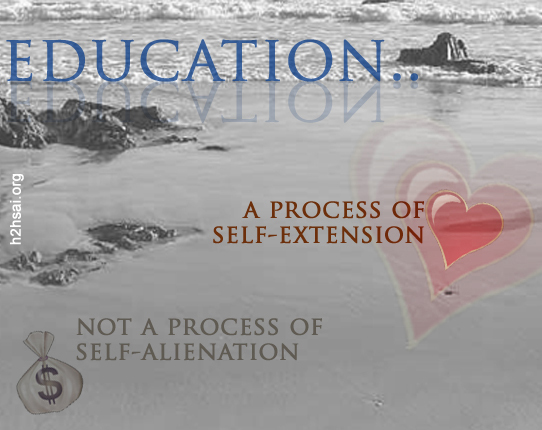 Education is ‘expansion of love’ not its contraction. Swami has given us a new recipe of education, and has showed us how to cook it. Compassion has never been part of a system of education except in Bhagawan’s university where it is embedded as deeply as mathematics, science or any other subject. However, this acquired a new hue in 2002. What actually happened was a very ordinary, and sadly so, incident. Ha, it is but ordinary (!) they say; can we afford to bother ourselves with such trifles! A newspaper reported that a mother killed her children and herself driven by extreme poverty. Did it create a ripple in the minds (for the heart has taken a holiday!) of our progressive millionaire society? But it drew a pearl of love from our Bhagawan’s eyes, and He scripted a new syllabus for the Sai university and school students. A symbolic intense drive into surrounding villages, predominantly poor, to explore a new dimension (and the truest) of education: two weeks of practising compassion. Compassion is the common denominator between God and man. Man becomes godly only when he identifies himself with the divine in all things in the creation. The God on earth now decided to teach at least His students the first alphabets of real education. Now for more than a decade Grama Seva (serving in the villages)has been an inalienable part of Sathya Sai syllabus for true education. Hridaya (Heart) has to be the seat of daya (compassion). Compassion can start in small measures, with people we meet everyday, with animals, with environment, with the elements. I have seen expression of this rare quality in an old couple quite close to me. The gentleman takes a rikshaw (later an auto) from home in his shopping expeditions. When he comes back he usually passes on to the man 5 or ten rupees more than agreed upon hiring charges, and if it is summer, he offers him a lunch too. Not only that. He would ask the man to rest a while on his verandah before going out in the sun again. He was by no means a well-to-do person. He was in fact just a small school teacher who found it difficult to support a large family with his meagre salary. But his compassion stopped at nothing. Now, about the lady of the house. She used to buy vegetables from vendors who call from door to door. In villages people usually do not buy vegetables from vendors, for they mostly grow their needs in their backyards. So people who depend on these sales for supporting a family find it very hard to make both ends meet. When such a person calls at the door, and tells her that she hasn’t sold anything till then, she would buy out the whole headload, even if she did not need all that, and give her a little more than the cost. In addition, she would sometimes even steal a sari from her own box and pass it on to her quietly. Offering the vendor a little water-rice (cooked rice soaked in water, a typical poor man’s fare)was never infrequent. When the gentleman died, people from four to five villages around gathered at his house at midnight hour just to be with the family, and attend his funeral the next morning. When his youngest son got a good job, and wanted to offer his first month’s salary to father in gratefulness, the father silently built a large shed in the cremation ground to be used by people who bring the dead for a ‘warm’ send off. 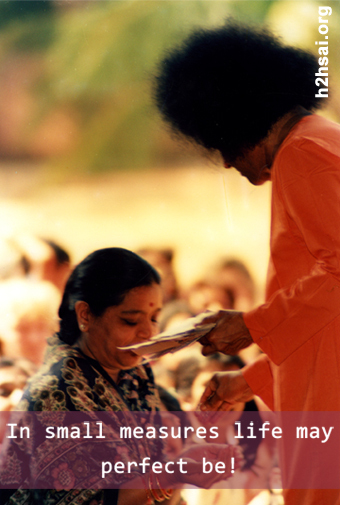 And when the lady passed away at Puttaparthi about two years ago, Swami looked after her funeral entirely. Compassion for fellowmen always attracts compassion from God. That is where man-in-God, and God-in-man meet. There was this woman I personally know. She loved to feed monkeys. Whenever she goes to buy vegetables for her kitchen, she always has a special budget for her friends, the monkeys. They would come to her kitchen window, and feed them in her own hands. If they don’t come on the day after she has bought bananas for them, she is upset, and would pray to Hanuman to send his flock. One day she went out to pick her sari from the clothes line outside, and there stood a huge monkey in front of her gripping her waist, ready to maul her. It was a very notorious gang leader who had bitten flesh out of many people. There was a small crowd of neighbours standing at a safe distance from her, voicing various expressions of sympathy, but no one dared a step nearer. This woman stood there calmly, and told the rowdy monkey, “Why do you threaten me? I haven’t done any harm to you”. The monkey gradually slid down, walked a few steps away and stood guard lest any other monkey hurt her. She took all the time in the world to collect her sari, smiled at the rogue monkey, and entered her house. Compassion has no barriers. It does not distinguish between a friend and a foe, a sadhu or a thief. During 70s I was working in a college in Odisha, and we were staying in an old thatched house with a walled courtyard, and an inside verandah opening to the courtyard. We used to keep our clothes of daily use on a wooden frame placed on the verandah. One morning we discovered that almost all clothes hanging there had been stolen during the night by someone who climbed over the wall to enter the courtyard. My wife was terribly scared and wanted to change the house. The next night Swami came in her dream and told her, “Why are you worrying so much? After all nothing much is lost. That man is very poor, and needed these clothes!” Look at Bhagawan’s compassion. The whole world may hate the thief, but He had nothing but love and understanding for him. He even chided her for contemplating to report it to the police. The new syllabus for higher education of Bhagawan’s students has caught the attention of the thinking world, which is growing increasingly aware that the most educated class is a threat to the world itself. Grama seva makes you aware that out there, there is a large humanity, which is basically an extension of yourself. Current education has done nothing to unite the academicians with the rest of the humanity. No syllabus or teacher today teaches us that education is essentially a process of self-extension. It has therefore turned out to be a process of self-alienation! No other university has yet shown the courage to re-examine their syllabus in this light because the untempered mind is still the high priest there, and compassion the lamb at the bloody stump! God is too non-secular, non-academic to enter the university gates!